Creating a new benchmark for boardrooms and client spaces. PwC has recognised that we live in a fast paced, ever changing world. Business is constantly being disrupted (think of uber, Air BNB and Amazon) and as strategic professional services advisors, PwC are acutely aware of this. They saw that to continue to innovate and remain leaders in their field, they’d need to completely rethink how they engaged with clients. The consumer/client/customer is more savvy than ever, and the level of service they expect is one that is flexible, adaptable, engaging and able to be customised to suit preferences. 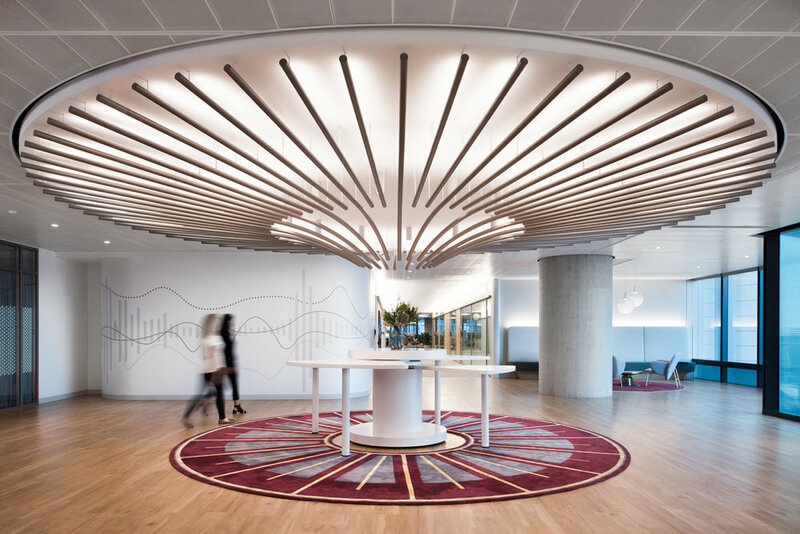 The brief from PwC to Futurespace was to create an end to end client experience that was exceptional, memorable and that embraced the best ‘outside of industry’ experiences to create something unique. 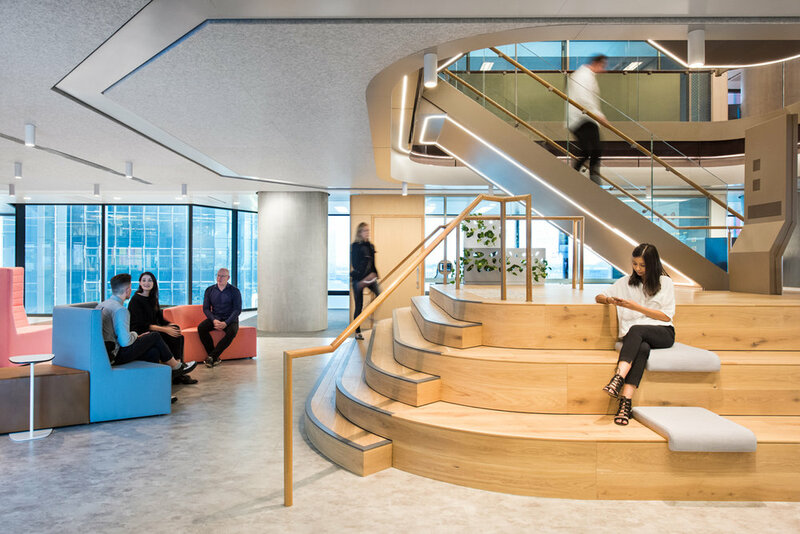 This has resulted in 4 Client Collaboration floors at Tower 1 Barangaroo Sydney that are a first rate blend of hospitality, hotel, retail, technology and airline club lounge spaces. These four Client Collaboration Floors challenge old ideas of formal client interactions and boardroom meetings. As this is a completely new way of working the design of the space needed to support people through this process of learning to use a new type of environment. 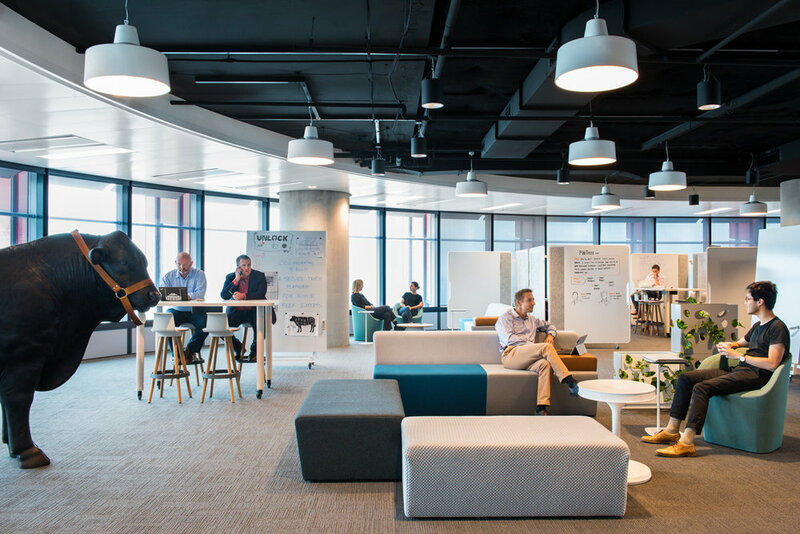 The Client Collaboration floors have been designed to be intuitive, and to give people ‘permission’ to use the environment in ways that best suit their needs. 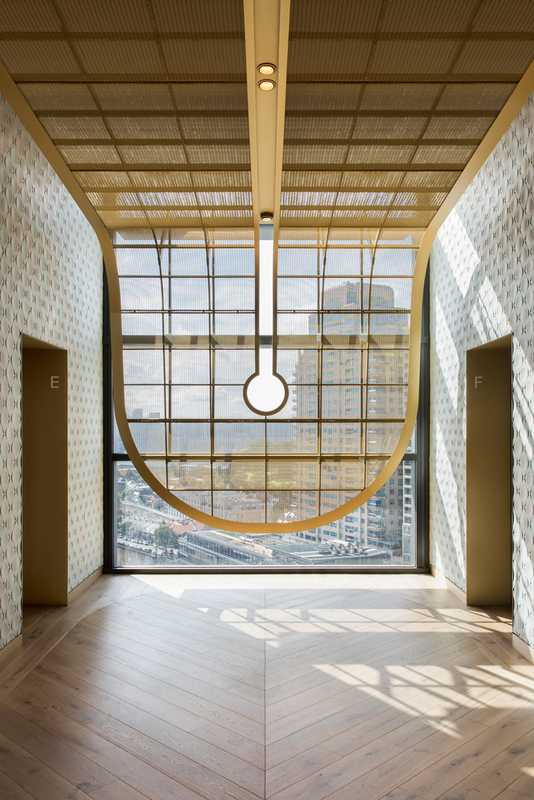 The floor plates are around 2200m2 in a lozenge shape, with about 70% of the perimeter glazing having clear views across Sydney and Darling Harbour – so there is a lot of natural light, a lot of sky. This played a significant role in how Futurespace determined the materiality and colour palette across the four floors. Sydney is a busy city and the pace of business is rapid. When people arrive at PwC they may already be experiencing a range of emotions. We have created an environment that is an oasis of calm but that still has a very inspiring and innovative energy. 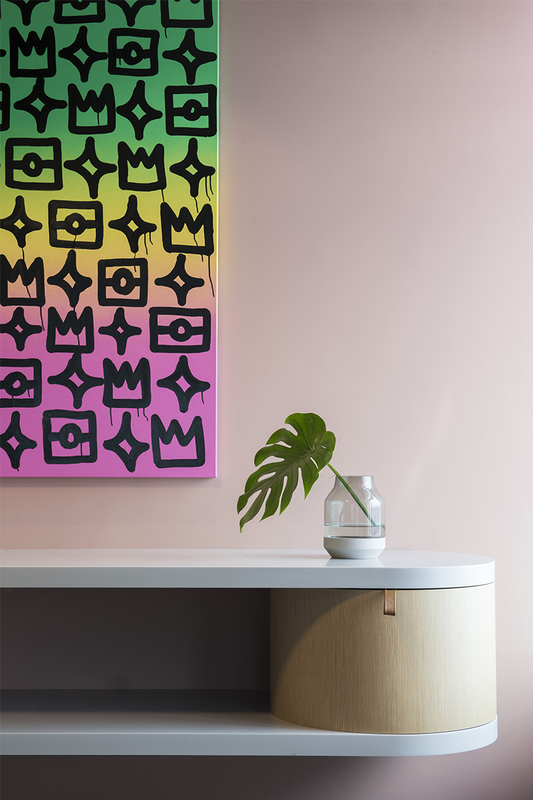 The choice of materials and colour palette intentionally supported this; they are balanced, calming with unexpected colour combinations that are still strikingly simple. The palette is soft, tonal and textural with no confusing or overwhelming patterns. The goal of the design was to keep the aesthetic welcoming and approachable, with the use of ‘everyday’ materials such as leather, concrete, timber and fabric underpinning this idea. How these elements were detailed though is critical. The attention to detail throughout is high, from the leather dowelled walls, to the etched Marblo welcome pods, to the custom designed rugs and the fine leather pull handles on joinery. Futurespace also worked with an art consultant to select a series of artworks that further enhance the surprising and unexpected elements of the design. The emphasis on detail expresses the idea that details matter, that whatever PwC clients and their people are doing it should be done well; there is a certain level of quality to the experience of working with PwC. 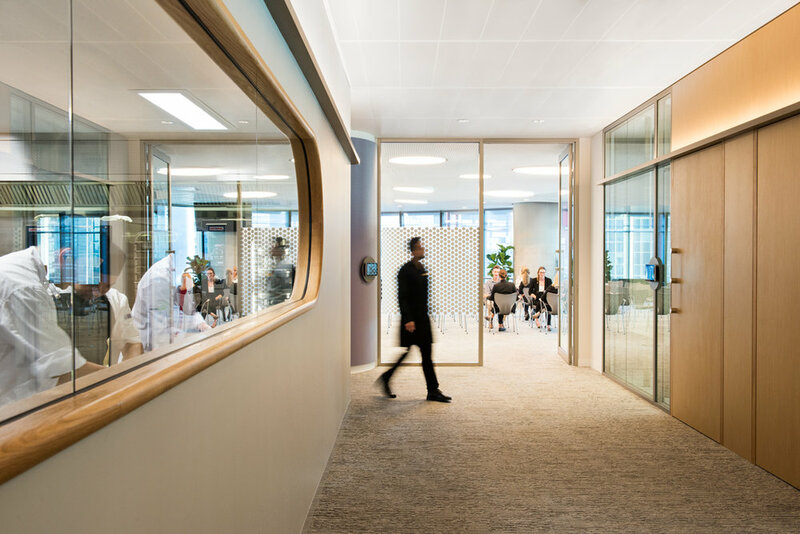 Openness is also key factor in the design – there are many more open settings than you would find in a traditional boardroom environment. The settings have been arranged in a way that is less institutional and formal and more about ‘togetherness’. 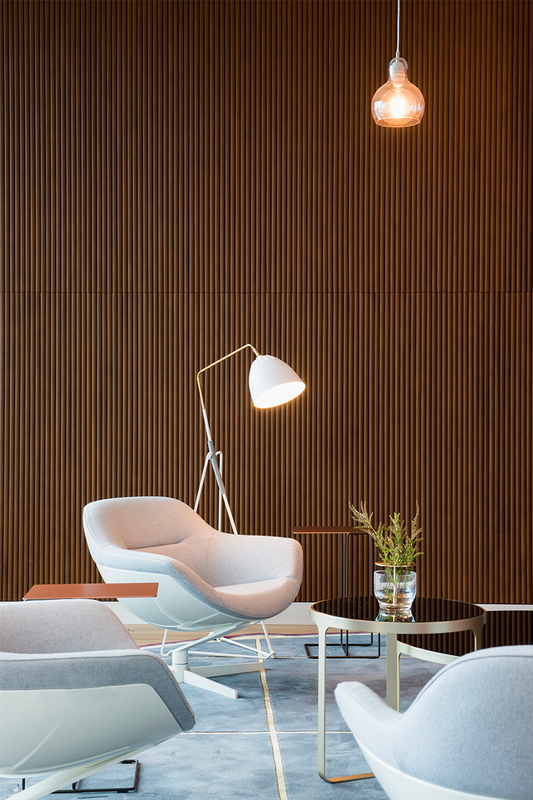 Much of the furniture has been selected for its more residential appeal, whilst still remaining ergonomic and therefore suitable for a working environment. Circulation and screens between settings are used as acoustic barriers and the softness of the round forms work with the lozenge shape of the building. 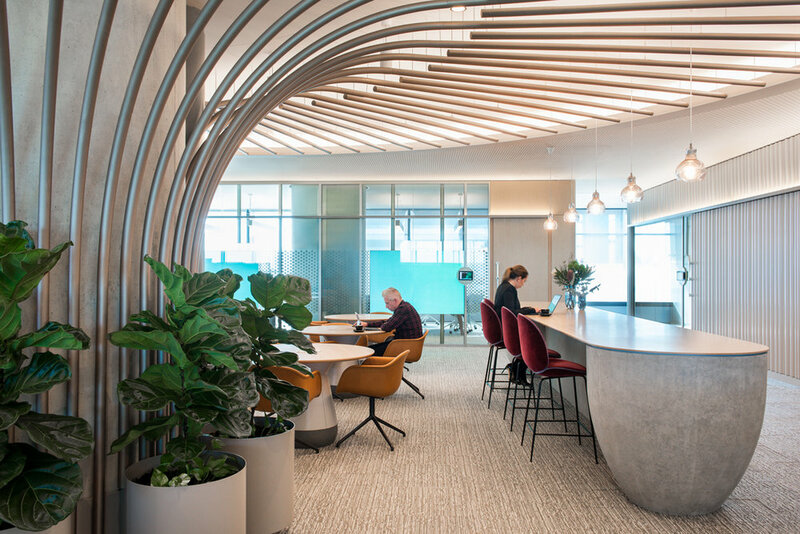 Throughout these Client Collaboration floors there is an emphasis on community, choice and collaboration in an environment that is the first of its kind in Australia.